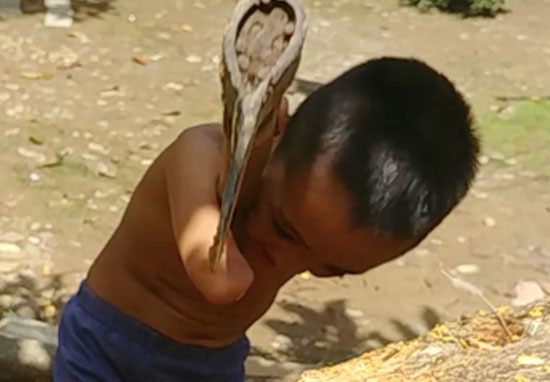 An inspirational young boy has proved that you can do anything with enough determination after finding a way to chop a tree with an axe despite having no arms. 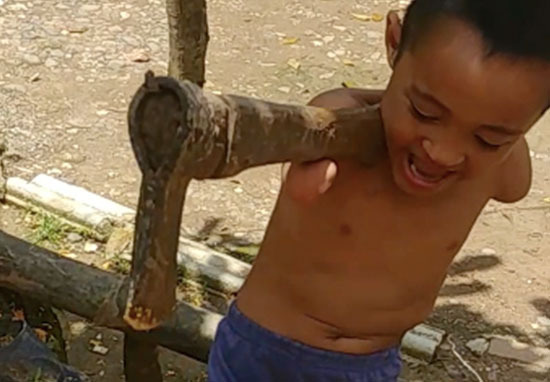 The young lumberjack lives in Kabankalan in the Philippines, and he reportedly wanted to use the video to inspire other people by showing the world what he can do. 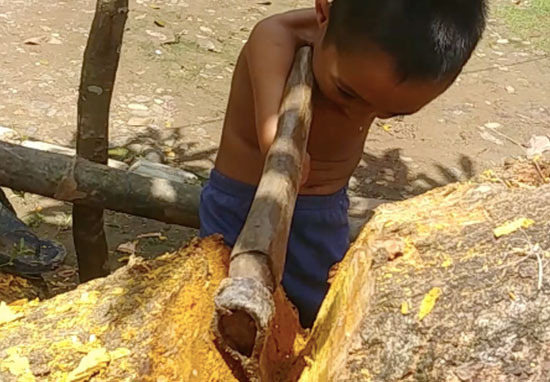 Grinning as he balanced the tool between his neck, shoulder and chin, the boy levered the axe so it gained enough momentum to cut into the tree. Filmed near the little boy’s house, the video is definitely a motivator for anyone who’s been thinking that a particular challenge is too much for them. I don’t think there’s any excuse for anyone not to do the washing up or take the rubbish out after watching this. I once attempted to chop down a tree, but only got as far as putting on a pair of gloves to hold the axe with. After putting them on I was informed that sometimes spiders like to reside in the finger holes, so I flung them off in fear, and sure enough a spider crawled out. I made no further effort to chop down the tree, but the handyman in this video is definitely making me feel like I should have tried harder. Viewers of the footage shared their praise for the driven young boy on social media. If you try hard enough nothing is impossible, no matter your condition. It looks like he has a lot of tree left to get through, but with his motivation I’m sure he’ll have found the strength to keep at it! One little girl who was born with no arms proved just as resourceful as the wood-chopper, as she taught herself to eat with her feet. Vasilina, from Russia, was filmed practising the skill by her mum, who shared the video on Facebook with the caption ‘For Vasilina’s fans’. Showing a coordination that would be hard to rival, Vasilina held a fork with her toes and managed to direct the food into her mouth – while many children her age probably would have ended up with a very messy face if they’d tried to feed themselves. Vasilina took a couple of attempts to find the perfect angle which would allow her to reach the food, but her determination made sure she ended up well fed. Her incredible actions were viewed over 78 million times and shared over 1.6 million times. The video has no doubt been inspirational for many people. oh my… Touched. Loving this little but already strong and amazing angel. Aww beautiful girl!! Not giving up!